After completing my last two books The Tourist Maps of Devon, which lists a large number of maps produced for visitors to Devon as folding maps or in guide books, and The Printed Maps of Exeter (see below) I have decided to sell a large part of my collection. This includes maps completed between 1575 and 1901 (see also my second web site The Victorian Maps of Devon). However, it also includes a large number of Victorian guide books - some of which were printed in long running series. A substantial part of my library is a very comprehensive collection of guide books on Devon as a whole and of individual towns and localities. I am especially proud of the collection of guide books covering all of Devon. These include all Murrays published between 1850 and 1901, all the Tourist Guides by R N Worth, a very good set of the Black’s guides, a copy of each of the five editions of the Baedeker guides of Great Britain (which include three small maps of Devon), an almost complete set of the Dulau guides covering North Devon and North Cornwall and of South Devon and South Cornwall as well as many early Ward & Lock guides. The collection contains so many of this particular genre that it would be a shame for them to be split up. For the purposes of research into guide books, their text similarities and differences, the advertisers and the publishers they would provide a unique resource if they were kept in one location. No institution has more than a handfull of any of these guides, and in some cases I have examples which are known in only a few rare copies. The collection cost far more than the asking price to put together. For this reason I am looking for a library or similar institution which would be grateful for the chance to purchase such a resource. Unfortunately I am not in a position to just give the collection away, but I am willing to part from them (and provide further unusual items as a bonus) for a moderate charge – well below my purchase price. I am looking for a sum of £1,500 (negotiable) for the complete collection. The collection consists of 16 Murray Hand Books from the first edition of 1850 to the last edition published with Stanford's cover imprint in 1901 (and including the biography of John Murray and a photocopy of the stock list at the time of Stanford's acquisition of Murray's stock). There are five Baedeker guides. Karl Baedeker published five editions of his guide to Great Britain (in English) before 1901. I can offer one copy of each edition. R N Worth's popular Tourist Guides to north and south Devon were published from the 1880s. I am offering 14 guides including two which combined the two separate guides. The first (edition) is not found very often, although this guide book series is quite common. Maps in most volumes vary from each other in some way although the text remains fairly constant. Black's Guide to Devonshire was an extremely successful series and I have 30 separate volumes from 1862 to 1921 plus 11 copies of the guide to the south-western counties which included Cornwall and Dorset (1862-1882) and three copies of their guide to England and Wales which also included a section on the south-west. Ward & Lock published a series of guides from the late-1880s and I have a number of early guides published pre-1901. In addition I have a series of guides to Torquay post-1900. While the latter are fairly common and later editions can be picked up for a couple of pounds at flea markets, the pe-1900 works are becoming hard to find. The combined volumes on north Devon and of south Devon are rare. I do not know of another copy of these outside Exeter. Another successful series was the Thorough Guide published by Dulau & Co. and written by Baddeley and Ward. I have 14 volumes on north Devon and north Cornwall and a further ten on south Devon and south Cornwall (including first editions of each). Any institutional purchaser will also have first refusal when I offer my other guide books, including a substantial collection of Besleys, when I decide to sell. If you are interested in finding out more about which books are being offered, please get in touch by email and I will send a data file with a complete listing. Guide to South Devon and North Devon in one volume. Published by Edward Stanford; 1886. South 135 pp., North 119 pp., followed by 24 pages of advertising (mixture with one listing the two-shilling series so far issued (21 so far), and others advertising Stanford's publications and some pages of local ads). South map has a tear, recently repaired, but which goes into the map area. Gathering here is loose and lower half coming away from binding a little. North map also has small tear, recently repaired. Advertising section gathering is falling out but is in good condition. The series of guides by R N Worth are not rare but the combined volumes (only found in first and third editions) are slightly harder to find. Richard Nicholls Worth (1837-1896) was a popular Devon journalist, geologist, author and editor of guide books. 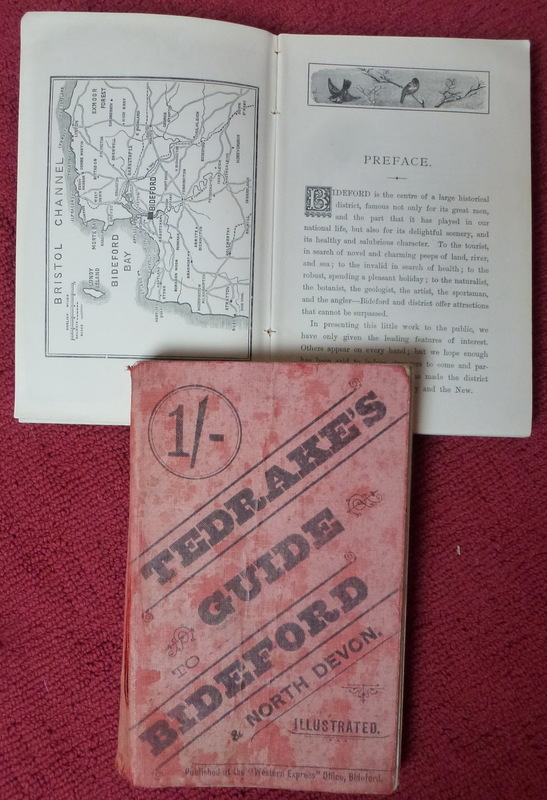 He produced two guide books covering north and south Devon in 1878/79 and these were printed and published until 1894 with maps by Edward Stanford. The south sheet map had a further printed map of the county as an inset. R N Worth is known to have spent six months researching the geology of the L&SWR Tavistock to Plymouth route in 1889 and read a paper to the Devon Association at Tavistock later that year. 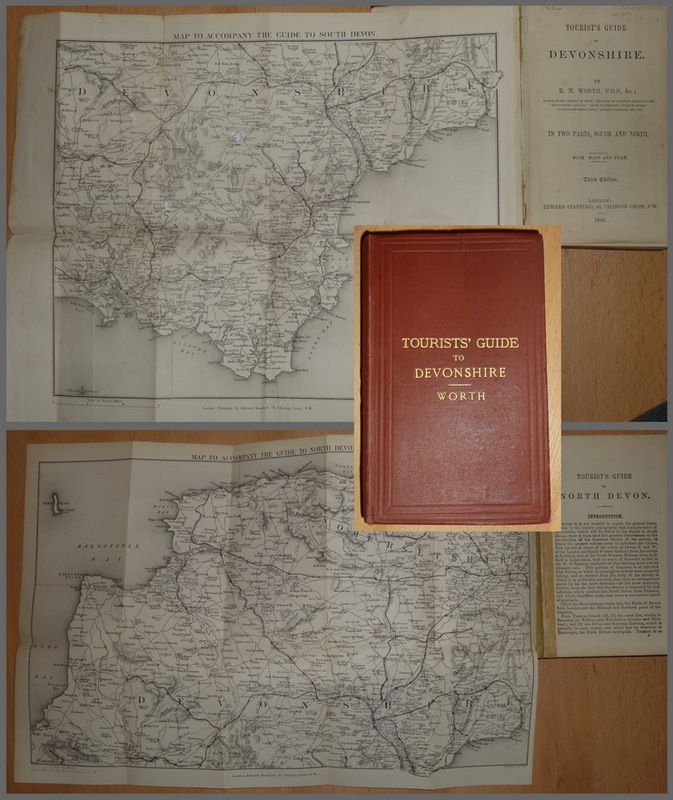 Worth’s guides to North and South Devon were published both individually and together as Tourist’s Guide To Devonshire In Two Parts, South And North; all contained maps produced at Stanford's Geographical Establishment. Although there were several editions the number of changes made was minimal and every attempt made to keep to the original pagination. Text written by local historian, R N Worth. 3rd edition. Red cloth binding with gilt title on cover and spine. Cover has a few stains and some spots. Two maps, one of South Devon opposite title page - B&B154S – state 4 and one of North Devon, inserted after table of Contents for North Devon Section (both sections paginated separately as for the individual volumes) is B&B154N – state 4. €20 or buy six items at €20 for only €100. Unusual guide to Bideford and North Devon. Victorian guide to Bideford etc; 116 pp. + 12 unnumbered advert pp. Crack in binding at p. 96 and cloth cover stained and in poor condition, a little bit loose. Front EP detached from cover board but complete and only needs glueing. Map of Bideford and photo illustrations. €20 Free postage - buy six items get one free! !